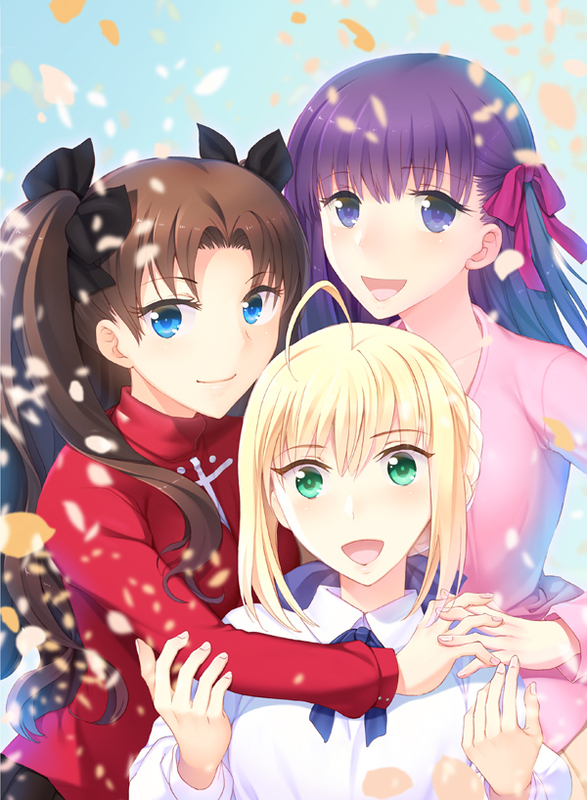 Fate Stay Night: The Three Routes – Anime Reviews and Lots of Other Stuff! Hey everyone it’s Deven coming at you with the first Fate Stay Night Speculation and it’s about the three routes. Now as we all know Fate Stay Night has three routes, Fate, Unlimited Blade Works, and Heaven’s Feel. Each route deals with a different part of Shiro’s self as well as the people around him. What I mean is that each route builds on the one before it. When you finish Fate, for example, Unlimited Blade Works assumes that you already know all the things that Fate taught you about Saber as well as Shiro’s ideals. As a result it doesn’t waste time explaining them. This type of story telling is really good because it makes for flawlessly perfect reveals. Things you’d never expect in one route are hinted at and alluded to but come out at the end. Also as said by the writer Nasu Kinoko each route has its own importance. The Fate route presents the question. The Unlimited Blade Works gives us the answer. And finally the Heaven’s Feel route gives the practical application and the results of the decision made. In this speculation I’ll be talking about the three routes at length, explaining a bit of the impact, reveal, and the journey that Shiro goes through as the route proceeds. The Fate route is the first one that you can play through and you must beat it first before you can go into the Unlimited Blade Works Route. In the original Fate/ Stay Night the end had Shiro return to his peaceful life while Saber returns to her time and accepts her past with a smile. However in the Realta Nua version of Fate Stay Night the True Ending exists for the Fate Route. However it can only be reached if you get all five original endings in the game. In the true ending, Shiro takes a path similar to Archer but instead of becoming a jaded bitter anti-hero ,he never gives up his ideals and and meets Saber in Avalon to be with her forever and all eternity. Next up is Unlimited Blade Works. The Unlimited Blade Works route is the second one that you can play through and you must beat it before you can proceed into the Heaven’s Feel Route. In the Fate/ Stay Night there are two ends. The Good ending shows Rin has Shiro and Saber as her familiars and the three of them live together in the Emiya house as friends and mutal lovers. The True ending shows Rin heading off to the Clock Tower Association after her graduation and Shiro accompanies her as her boyfriend/apprentice. Also Saber destroys the Holy Grail but departs happy. Third and final is Heaven’s Feel. The Heaven’s Feel route is the third and final route that you can play through. You can only get it by beating Fate and Unlimited Blade Works. The theme of this route is still love but the major theme is harsh realism. During this route, Shiro falls in love with Sakura and the question given in Fate and the answer given in Unlimited Blade Works are put to the test. The answer is ‘I only want to save those important to me, regardless of any negative consequences done to others in the process.’ Shiro comes to this answer after realizing his feelings for Sakura and understanding that his feelings for her are more important than his ideals. In Fate/ Stay Night there are two ends. The Normal End shows an epilogue after Shiro sacrificed himself to destroy the Greater Grail beneath the city. Sakura refuses to believe that he is dead and lives in the Emiya residence until the day she dies. Shiro never returns. The True End shows a different epilogue where Illya sacrifices herself to use an incomplete version of the Third Magic to save Shiro’s soul and implant it into a puppet body made by Touko Aozaki(a character from the shared Nasuverse that all media made by Type-Moon are in). Shiro leaves a peaceful life with Sakura and Rider. And that’s it! The emotional power of Fate/ Stay Night is what allows it to endure a top class Visual Novel as well as be an excellent anime and light novel. In your opinion, which is the best route for this series? and also I’m planning on watching this soon and I’m confused which route to watch first as everyone has been giving me different answers. so… which route would you recommend to watch first for a beginner to this series and also someone who is not planning on reading the visual novel? All three routes are the same war but different events happen during each one because of different circumstances. I’d always recommend reading the visual novel but if not and you only want a good anime I’d recommend either Unlimited Blade Works or Heaven’s Feel: Presage Flower, both by Ufotable. Unlimited Blade Works and Heaven’s Feel are, in my opinion, the most interesting routes, both ideologically and action wise.